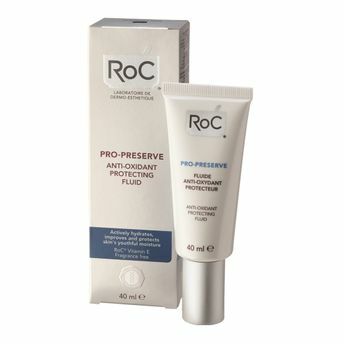 The RoC Pro Preserve Antioxidant Protecting Fluid actively hydrates and protects skin's youthful moisture. It combines 2 powerful antioxidants - vitamins C & E that protect skin from external aggressions such as pollution, wind, cold. It also contains UVA & UVB filters to protect skin against photo-ageing and prevent any signs of premature skin ageing. Its hypoallergenic and fragrance-free formula has been developed to respect even sensitive skin. Its fluid and light texture penetrates rapidly into the skin. Vitamins C & E: Effective antioxidants that protect skin against the harmful effects of free radicals and against external aggressions. UVA & UVB filters: Prevent photo-ageing and protect skin against sun-induced damages. About the Brand: Engaged in cosmetic research for over 50 years, RoC has a record of product innovations to their credit.Created at the Roge Cavailles pharmacy in 1957 by Dr. Jean-Charles Lissarrague, a Parisian pharmacist who believed in a more proactive, positive and pleasurable approach to beauty, RoC's revolutionary line of skincare was born. Every RoC product is artfully-crafted and scientifically-tested to ensure nothing but the best in quality. The experts at RoC have developed some unique, long term, holistic solutions: high performance skin care products but also daily management anti-ageing programs to truly give women the power to age beautifully. Explore the entire range of Body Sunscreen available on Nykaa. Shop more RoC products here.You can browse through the complete world of RoC Body Sunscreen .